Indeed, you can. Is it the case that when you had a GARAGA garage door installed a few months or years ago, you opted for no windows? Now, you find your garage is dark, especially when you want to do some tinkering around or even use it as a workout room. 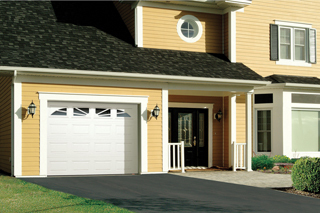 Or, could it be that you want to give your garage door a more attractive appearance and match it with your entry door? A sandwich-type with polyurethane foam insulation? A sandwich-type with polystyrene insulation? Based on the type of door you have, certain window models and sizes are available. Depending on why you want to add windows, here are some tips for choosing their location. If you are looking to maintain a level of privacy or security while letting in daylight, the top section is the best location. If you want windows for looking outside or inside the garage, the 3rd section if the right spot. If this location is what you prefer but you also want privacy, request mirror or dark gray tinted panes, as with these you can see outside well but it is difficult to look in. 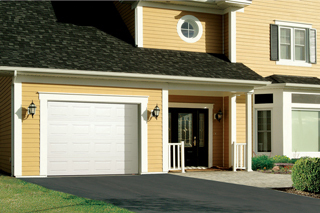 Try out our Design Centre to see what your garage door will look like. Is it possible to coordinate with the windows in my house? Certainly. Homeowners often want to coordinate the window model of their house and entry door with that of their garage door, particularly when the garage door is on the front of the house. As an example, if the windows in your entry door have Georgian-style grids, you can match them with those in your garage door. What will happen to my spring system if I add windows? Based on the quantity and type of windows you select, you need to know that this addition will disrupt your spring system which acts as a counterweight. All spring systems are calibrated with a maximum variation of +/- 5% of the total weight of the door, meaning you should plan for the additional cost of readjusting your spring system. If your door weighs around 125 lb. (57 kg) and you add a row of windows to the top section, say four 21" x 13" (53 x 33 cm) windows, the door will become unbalanced and the spring system must be readjusted . Don’t tell yourself This isn’t important and, in any case, it’s the opener that opens and closes the door . A door opener only replaces human strength. A well-balanced door weighs only about 8 to 10 lb. (approx. 4 kg), easy enough to be lifted with one hand. In addition, in order to not weaken the structure of the door sections, there are some limitations regarding window size. Lastly, when a complete row of windows is installed in the top section, this section must be reinforced when an electric door opener is connected there. A reinforcement bar along the entire width of the door is added. Do not try to do this type of installation by yourself because cutting holes in your current garage door and ensuring it is correctly balanced requires expertise in this field.